The historical land of Azerbaijan Yerevan was ceded to Armenia on May 29, 1918. How and why was it ceded to Armenia? Defence.az will present the details on the dramatic time of the new history of Azerbaijan to the readers in upcoming days. The foundation for ceding the Western Azerbaijani lands was laid during the First World War. The Russian Army had 150,000 soldiers to occupy Eastern Anadolu. Russian troops withdrew by giving in the weapons to their Armenian commanders after an upheaval in Russia on November, 1917. Thereafter, plunders which ended up with 1918 March Genocide were launched. The Armenian troop which withdrew and was under the control of Andranik, Hamazasp, Dron and Njdeh conducted massacres against Muslims in Erzurum and Kars counties, as well as in Yerevan and Zengezur. The Armenian Armed Forces destroyed 32 villages in Yerevan county of Yerevan province, 84 in Echmiadzin, 7 in Novo-Bayazid and 75 in Surmeli – totally 198 until March 1918. Approximately 135,000 Azerbaijanis were subjected to genocide. In other words, the Muslim population of Yerevan County was left to their fate. No one supported and protected them. They only counted on Ottomans. Notably, on May, 1918, Turkish army expelled the Armenian Armed groups from Gyumri and Boyuk Kara Kilse cities by chasing them. Although they arrived in Ulukhanli station which is located 9 km of Yerevan, they moved in the direction of Nakhchivan. Khalil bey Khasmammadov, Mammad Yusif Jafarov, Akbar agha Shaykhlislamov and Muhammed Maharramov called the ceding of Yerevan to Armenia as a historical necessity and inevitable misfortune in their statements. The members from Yerevan of the National Council immediately expressed their objections. In regard with the issue, 16 of 26 Council members voted for and 1 against the ceding of Yerevan to Armenia, 3 voters remained neutral. Thus, Azerbaijan National Council adopted a decision the ceding of Yerevan to Armenia. Azerbaijan and Armenia declared their independence on May 28, 1918. on May 29, the decision on the ceding of Yerevan as a political center to Armenia was adopted at the meeting of the Muslim National Council. However, 16 of 28 National Council members voted for and 1 against the adoption of the decision and 3 people remained neutral. Prime Minister of the Azerbaijan Democratic Republic, Fatali Khan Khoyski wrote to Foreign Minister Mohammad Hasan Hajinski: `We finalized all conflicts with Armenia and they will accept the ultimatum and stop the war. We ceded Yerevan to them`. However, the opposite happened: After the movement of the Armenian government from Tbilisi to Yerevan, the genocide against Azerbaijani people was continuing in Yerevan and other historical territories of Azerbaijan. According to the peace and friendship agreement signed between Turkey and Armenia dated June 4, the territories of the Republic of Armenia constituted 10.000 sq. km and had 321.000 population (230.000 Armenians, 80.000 Muslims, 5.000 Yezidi Kurds and 6.000 other ethnicities). The territory of the republic consisted of Novo-Bayazid county, three-fifths of Yerevan county, one-fourth of Etchmiadzin county and one-fourth of Alexandropol county. In the meeting of the National Council dated June 13, the news from Yerevan about the massacres against Muslims by Armenians was discussed. It was stated that the number of IDPs and impoverished refugees reached to 150.000 and 206 villages were destroyed by Armenians. The National Council decided to send representative to assist refugees in Yerevan province. Besides, the Headquarters of the Turkish Army in Yerevan was asked to make food assistance as well as affect the Armenian government to return refugees to their settlements. Azerbaijan diplomacy took relevant steps after the occupation of Zangezur by the Armenian Armed Forces under the command of Andranik and consideration of Nagorno-Karabakh as disputed territory by Armenia. The Azerbaijani diplomatic representative in Georgia wrote a letter to his Armenian counterpart in Georgia. 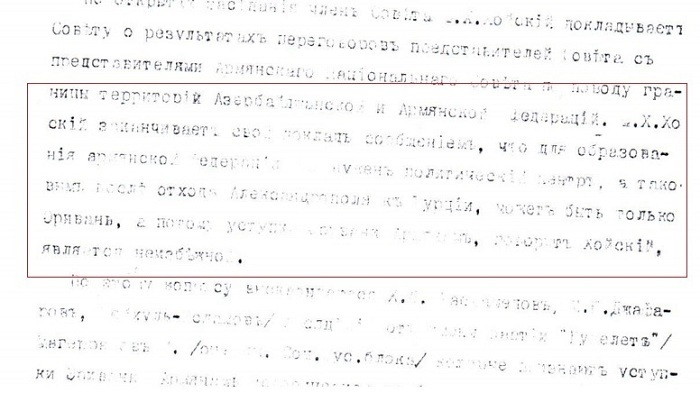 The letter states that Armenia`s claim to consider Nagorno-Karabakh as disputed territory is the violation of the agreement and also Azerbaijan holds the right to maintain Yerevan, Etchmiadzin, Novo-Bayazid and Yerevan counties of Yerevan province. According to the Mudros agreement signed on October 30, 1918, Armenians carries out the second stage of massive robbery and massacres against Azerbaijanis in Yerevan province after the recession of the Turkish Armies from South Caucasus. 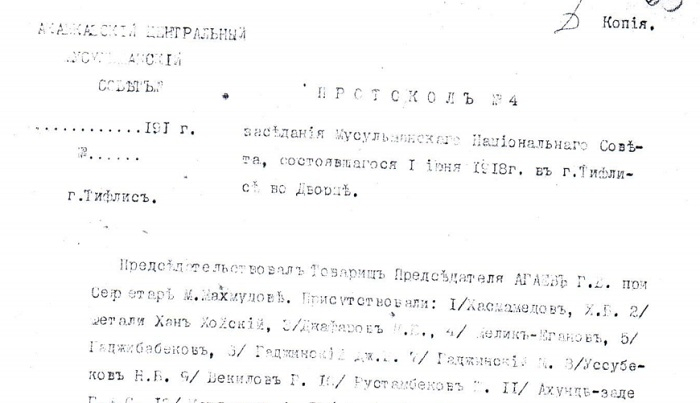 The head of the Organization of Compatriots in Yerevan province sent information on January 4, 1919. It was stated that more than 200 Muslim settlements were destroyed, plundered, fired and people were killed and the other part of people fled to mountains and died of cold from December, 1917 to June, 1918. Armenian Armed units occupied the Surmali, as well as parts of Sharur-Dereleyez and Yerevan counties. They moved in the direction of Nakhchivan. Innocent Muslim people were brutally exterminated. The survivors fled to Iran passing through mountain roads. Armenian refugees came from Turkey were settled in the muslim villages which were forcibly deserted, Teymur Khan Makinski wrote. On January 4, 1919 the members of Parliament Teymur Khan Makiniski, Muharram Maharramov, Akbaragha SheykhUlIslamov and a group of intellectuals of Yerevan province signed an appeal and addressed to the Speaker of the Parliament. The appeal reads that 500.000 Muslim people consider themselves as an integral part of Azerbaijan and they hope to live peacefully without any interference of Armenians till their destiny defined at the Paris Peace Conference. After enumeration of the scope of the Armenian-committed massacres, they appealed for the protection of the muslim people living in Yerevan province. The Commander of the Allied Forces in the South Caucasus, A.Thomson`s pro-Armenian position encouraged the Armenians to occupy more territories. On May 28, 1919 the Armenian Parliament adopted an act regarding the establishment of `United Armenia` at the cost of the annexation of 6 Turkish provinces to Armenia. The territories claimed by Armenia to Azerbaijan were also included the `United Armenia`. The issue of refugees was discussed in the meeting of the parliament dated January 5, 1920. It was reported that totally 300.000 refugees came from Armenia. The Bolsheviks provided favorable basis for the Armed Forces of Armenian dashnaks to perpetrate massive crimes against Azerbaijanis. The reason of the survival of a part of Azerbaijanis living in Yerevan was their compact living (in Demirbulag, Gala city and Old city parts of Yerevan) and the control of Azerbaijan`s diplomatic representation, the Ministry of the Guardians, the Muslim Charity Society over them. According to 1916 report, totally 373582 Azerbaijanis live in Yerevan province. However, only 12 thousand Azerbaijanis were registered in the Armenian SSR on November, 1920. A little part of the Azerbaijanis managed to return to their homelands, right after the establishment of the Soviet regime in Armenia. Although 5124 Azerbaijanis live in Yerevan in 1922, the number of Armenians reached to 40396. In other words, during 1918-1920 the number of Azerbaijanis decreased 2.5 times and the number of Armenians increased 4 times. In such a case, South Caucasus Seim was dissolved on May 26, 1918 and Georgia declared its independence. At Muslim National Council meeting held on May 27, Nasib bey Yusifbeyov said that the delegation representing Turkey at Batumi conference came to conclusion that the South Caucasus had to protect its independence and a few lands had to be ceded to Armenia in order to protect its unity and solidarity. Possibly, it was a strange approach. How could the independence of South Caucasus be discussed at that time? Fatali Khan Khoyski made a report about the results of the discussions held between Azerbaijani and Armenian members of Councils on the territorial issues in consistency with the N 3 protocol of the meeting of Azerbaijan National Council on May 29, 1918. Khoyski has noted the necessity of a political center for establishment of Armenian Federation and in addition described the city of Yerevan as the only possible and inevitable one, since the Alexandropol (Gyumri) became a part of Turkey. Then it is of importance to cede Yerevan to the Armenia.